Every day in February the Magazine is featuring a classic public information film from the past 60 years, concluding with a vote to find the nation's favourite. Today's film is a real treasure. It's got everything you could want from a public information film - a slogan, dated costumes, a bit of nostalgia - but is also unintentionally amusing. It's an attempt at improving road safety for children, and came a year after Dave Prowse (later Darth Vader) had first played the Green Cross Man. The film dates from 1976 and stars the late Jon Pertwee, then just two years after having left the role of Doctor Who. He is essentially playing the same part, though - a curious uncle figure who is explaining the world to his young charges. Unfortunately the message of this film seems so complicated one almost needs the Tardis's translation software to understand what he's going on about. Where the Green Cross Man's approach was simple ("look and listen all the way across"), it must have been decided that children needed the rules of safe crossing spelling out for them more precisely. Which is where the problems start. 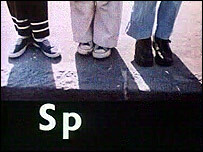 PERTWEE: Stand on the Pavement near the kerb. PERTWEE: Look all around for traffic, and listen. PERTWEE: If traffic is coming, then let it pass. PERTWEE: When there is no traffic near, walk straight across the road. PERTWEE: Keep looking and listening for traffic while you cross. 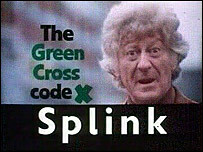 PERTWEE, to camera: Well now we'll all remember the Green Cross Code, and use it. 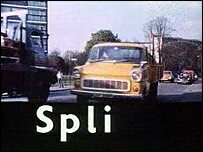 Splink! Yes, of course. How could we not all remember the Green Cross Code, after such a memorable and well-crafted aide memoire! In fact, of course, what people were more likely to remember was the last second of this film, when Pertwee shouts Splink. It's a remarkable shot, not least for his outfit. But his expression is absolutely bizarre, presumably by design. It is very funny. Well, it would be funny, if the subject wasn't so serious. 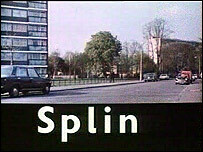 The Green Cross Code was introduced in 1971, with "splink" as a supposedly handy mnemonic. But surprise, surprise children found it too complicated. The Times of 10 July, 1974 (before this Pertwee film was released) reported that in a survey of 595 children aged between seven and 15, precisely none could remember the drill in full. Furthermore, only 18% of children chose the safest place to cross the road. The slogan was just too complicated to embed itself in children's minds. That's perhaps understandable - without looking, can you remember what the "I" stood for, let alone the "N"? It's easy to understand why so much effort went into the campaigns, though. In the early 1970s, children accounted for half of all casualties on the road. Though a huge push was given to the launch of the Green Cross Code, resulting in an 11% drop in casualties, six months after the campaign had ended the rate was as high as before it had started. 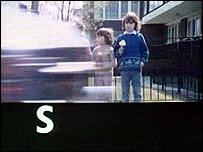 In 1975 there was some relief that the number of children killed on the roads had fallen to 505, a low since the 1950s. That trend has continued - in 2001 it had come down to 219 - a success which educational campaigns must take some credit for. But with a further 38,000 children still being injured on the roads in 2001, the work is far from done. PS. There's still no sign of Reginald Molehusband, the classic film which seems to have gone missing from everyone's film libraries (including the BBC, the Central Office of Information - which made the film in the first place - and even the National Archives). We're following up a couple of leads, but there's still a chance for someone who owns a copy of this film on VHS or any other format to come forward and become a national hero. Contact us using the form below. Do you have 'Protect and Survive' on your list? It sits slightly apart from the type of film you're looking at, but is well worth examination. In case you're unfamiliar with it: 'Protect and Survive' is a guide, produced in c.1980 to what to do in the event of nuclear war. It would have been shown regularly if for any reason a nuclear strike seemed likely. I saw it at the Imperial War Museum; it also appears a good deal in the mid-eighties BBC docudrama 'Threads' (which caused many a nightmare). 'Protect and Survive' is a real oddity as the content is absolutely terrifying, but the eighties voiceover, sound effects and graphics all push it into the realms of nostalgia. The combined effect is decidely macabre. I dont think a month goes by and I dont think of Reginald Molehusband. Ulster television used to show it a lot right up to the early eighties. Surely they must have a copy lying around somewhere? Is the androgynous kid in blue a young Todd Carthy (alias Tucker Jenkins/Mark Fowler)? YOu state that "In 1975 there was some relief that the number of children killed on the roads had fallen to 505, a low since the 1950s. That trend has continued - in 2001 it had come down to 219 - a success which educational campaigns must take some credit for." Of course the real reason less childen are killed on the roads is that most are driven around by their parents these days, as opposed to walking! Government education campaigners should take no satisfaction from this at all. S.P.L.I.N.K. did work! I used it with my 21 year old and my 12 year old and will also use it on my 3 preschoolers when the time comes. For me, as someone who couldn't figure the right from left, so gave up without trying it was a huge improvement on, "Look right, look left, look right again" At least I atood a chance of getting S.P.L.I.N.K. right and was not confused before I started! 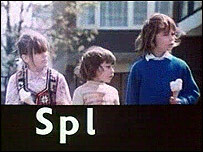 Incidentally, if parents are not teaching road safety using S.P.L.I.N.K., what method is used now-a-days? All other objects do the same. Invariably fall down not up. Especially on your head and toes. So get a hat and keep your head. The affects of gravity can be grave. You've touched on an important point here, (I've written to several newspapers and the DOT on this, with no results so I'm hoping for a better response from the BBC) I think that the child road safety adverts which show how a hedgehog should cross the road whilst avoiding elephants, are ineffectual and misguided. I asked my 4 year old daughter what she thought they were about and replied that she had no idea. The "Green Cross Code Man" adverts from the 1970's had many advantages: It provided a police-like authority figure, used to instil obedience. It provided a clear set of rules to follow when crossing the road. The consequences of not following these rules, were demonstrated as a dressing down from the Green Cross Code Man. I'm sure if you were to consult a psychologist, it would be shown that the Green Cross Man adverts had many other advantages, and I believe were much more effective in instilling the message. I would therefore like the BBC to start a campaign to lobby the department of transport to replace these adverts with more effective ones, aimed at saving children's lives. Nothing much has changed in the intervening 30 years. Road Safety messages put out by the Governmant were, are still are , incomprehensible. The improvement in Child accident figures has nothing to do with "Road Safety" authorities and almost entirely due to safer cars with better breaks and better road layouts. Keep the Government out of any decisions and things will improve. (Did you know that one of the most dangerous places to cross a road is next to a Speed Camera? Drivers are concentrating on their speedometers and not on the road! Well done Department for Transport!! It's the K that confuses me, although I have to admit the recent ads featureing an apparently dead little girl travelling backwards through time and unbreaking her arm actually DID give me nightmares, so I'd rather SPLINK any day! There is a PIF that I remember from my very earliest pre-school days which I have never seen repeated. It's an Information Film about the Country Code. Not one of the silly animated ones but a live action film of some walkers set to "soothing" music and voiced over in true BBC style. PS I can't believe they've lost Reginald. Pertwee does look completely bizarre, we'd never let him near kids these days! Isn't that Todd Carty in the blue jumper? Regarding the statistics for children killed on the roads dropping to 219 by 2001, surely a major factor is the fact traffic volumes are now so great they can't play on the street and thus put themselves at risk? By extension could the number of children killed or injured on the roads not be just the obvious victims? What about those who develop health problems or die prematurely in later life through not developing good exercise habits as a child? I'm surprised the survey you mention found such discouraging results. I was 6 at the time. 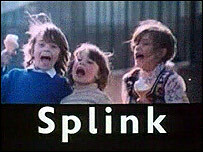 What SPLINK stood for went straight over my head, I realise now, but I could recite the advert from memory, and discover today having seen the film again that I still can! I'm even older than the Green Cross Code! We had Kerb Drill - stand in a place where you can clearly see both ways, look right, look left, look right again and, if it's all clear, walk straight across and keep looking. Simple. At our school, we all belonged to the Tufty Club, Tufty being the wise red squirrel who had devised the drill and we all received a Tufty handkerchief with the Kerb Drill printed on it and a cream filled chocolate Tufty bar. We all remembered our kerb drill because it was so simple although, of course, the roads weren't nearly as busy then as now. Thats about as bonkers as the one we had when I was a kid. Dave Prowse aka Green Cross Code man came to see us when I was at school in West Hill, Aberdeen, taught us a song about crossing the road called "stop, Look, Listen & Stink" (hoho!) and then proceeded to field Star Wars questions. It was about 1985-86, but at least I remember the message!